Robots have been on the horizon for past few decades, but their application in our daily lives is only now becoming a reality. The first generation of affordable robots for home use has arrived, and we are relegating to them those monotonous homeowner chores we'd prefer not to do. Robot vacuum cleaners like the Roomba are now being upstaged by their outdoor cousins: the robot lawn mower. Homeowners who've dreaded sweating out their weekends trimming grass and in the battle against weeds are happily welcoming the newest programmable tools, the robots that take, literally, all the labor out of mowing the lawn. If you've ever considered upgrading your push mower to a riding mower, then you surely have compared lawn mower prices. 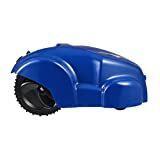 Although still expensive at more than $1,000 for most models, the robot lawn mower is arguably a better value in terms of labor and money saved. That's because once it is installed, it doesn't demand storage space like a bulky riding mower would and requires none of your time -- meaning you're freed up to enjoy your weekends! Today, as a consumer, you finally can benefit from decades of research into improving home appliances. 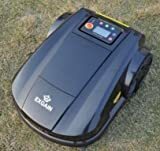 Here, we have reviewed the top eight brands and models of robot lawn mowers available at your local home improvement store or, even more conveniently, online. So, check out these robot lawn mowers options and what they can do for you. It's time to take back your weekends. That is, it's time you own the first robot lawn mower on your block! 1. WHAT IS A ROBOT LAWN MOWER? The term "robot" defines a mechanism designed to assist a user with a specific function through pre-programming (built into the machine) or through programming after purchase (customized programming by the owner.) What makes a robot different from other software-powered machinery is that it moves under its own power to complete a task. Today's consumers commonly use robotic devices to help at home, such as vacuum cleaners and more recently robot lawn mowers. 2. WHAT FUNCTIONS DO ROBOT LAWN MOWERS OFFER THAT A PUSH MOWER CAN'T? The main advantage of a robot lawn mower is that it saves effort and, potentially, money. If you take care of your lawn yourself, then the chore requires your time and exertion -- especially if you use a push mower. Even if you outsource the job, then you still are paying a lot of money to keep the lawn trimmed. A robot mower may require a larger up-front investment, but it can save you money and time in the long run. The robot lawn mower is relatively independent of its owner, can sense weather changes and can mow in the same pattern each time, producing even, well-groomed landscaping. 3. HOW DOES A ROBOT LAWN MOWER COMPARE WITH A RIDING MOWER? Riding lawn mowers are great at saving on physical exertion, especially if you have a large yard, but they can't reach every little corner and cut-out of your yard. You still, however, have to use your time to command the machinery and riding mowers cost a lot of money to buy and maintain. In comparison, robot lawn mowers can be programmed by their users to reach specific spaces or tight corners. They save labor and a great deal of your time. And, in many cases, they don't cost as much as a riding mower or require storage space. 4. WHERE CAN YOU BUY ROBOT LAWN MOWERS? As the technology advances, these mowers are available in more places. Currently, all models listed here can be purchased on Amazon. 5. WHO IS THE IDEAL CUSTOMER FOR A ROBOT LAWN MOWER? Robot lawn mowers are ideal for a person who has a medium-sized to large-sized lawn and who doesn't enjoy (or have time for) yardwork. They are also ideal for those who are comfortable using software to set up a small machine -- like that found on a smartphone or robot vacuum. Even for someone who has a smaller yard, and especially one that has many hard-to-reach spaces, robot lawn mowers can be a great solution. And, they're perfect for someone who lacks garage or other storage space for a riding mower. We chose the following models for our review and compared them according to their individual features, warranties, pros and cons and other important considerations. This list has been compiled carefully, using comparable products that fall into the same class. And, all the products reviewed here satisfy basic consumer needs, including affordability and availability. We strive to compare lawn mowers that are in the same class in terms of their basic functions, but do highlight unique features for each product. Generally, robot lawn mower prices range from $600 to beyond $3,000. The models we decided to review here start at a price of around $600 and goes up as high as $2,500. The Worx is so named because it takes on a lot of labor and covers a lot of ground. Relatively affordable, this mower comes with a weather feature so it can handle rain. It also includes a reasonable charging time of 90 minutes and can take most inclines in stride. The Landroid model is an excellent all-around machine that comes at a relatively affordable price and that is able to avoid most objects in its path as it gives your lawn a good trim. Available on Amazon within the range of $900 to $1,000. This mower has a 1-year warranty that covers the replacement of parts. Warranties on repair may vary depending on where the item is purchased. Ideal for large yards up 3/4 of an acre. Can cut on slopes up to 36% (20 degrees). Very powerful and very quiet - allows you to enjoy your lawn even while Robomow is mowing. This robot lawn mower comes from a reputable manufacturer -- Honda. You can control it via smartphone. It has a weather feature that senses rain and directs the mower to return to its home base. Installation is possible for the average homeowner, but requires the installation of a boundary wire. The Robomow is a first-generation robot, but its performance on all the robot basics has not been outdone. It mows up to 3/4 of an acre and bests other mowers in incline capacity, with up to a 20% grade. Available on Amazon for around $2,250 to $2,500. The RS630 is fully covered by a 1-year warranty for parts and labor. Rear wheel it heavier than S510,can keep from slippery when running on slopes and hills. This programmable mower is lightweight, quiet and user-friendly, so it doesn't require strength or an advanced degree to use. It does, however, require professional installation. If you're willing to invest in the installation, then this device is the most hassle-free mower on our entire list. It lacks a weather sensor, so it may be less ideal for homeowners living in rainier areas. This model avoids obstacles like a pro. You pay a lot for this brand, but in return you get reliability and the assurance that the company will stand behind this product with a robust warranty. Available on Amazon from $1,500 to $1,750. The 1-year manufacturer's warranty is standard and guarantees parts and labor. Key features of this product include built-in sensors that allow the mower to avoid obstacles. This mower can sense when a patch of grass is too high, and will seek and cut specific patches of grass to keep a consistent height. Like most of the other mowers reviewed here, it includes anti-theft and a mobile app to customize programming. It does not have a weather sensor or anti-theft device, but has a satellite tracker to monitor if someone removes it from its area. Available on Amazon for around $1,500 to $2,000. Ask about warranty at the time of purchase. Covers 2000 sq ft lawn. Mowing time 90-120 minutes. Max slope of 15 %. This is the affordable option, but it does everything needed for a yard that is less than a quarter of an acre, such as yards found on smaller city lots or townhomes. In addition, this unit is the user-friendly option: blades can be swapped out easily, installation is workable for any owner and there is no complicated programming needed. The mower is programmable through a panel, similar to the way a robot vacuum cleaner works. Available on Amazon for around $600. This mower is protected by a 1-year manufacturer's warranty. Easy to use with flexible installation options and full control from your smartphone! Smartmow feature provides seamless maneuverability and motion for an uninterrupted, meticulous mow. Promotes a longer mower lifespan and up to 10% faster area coverage! This model is similar to the Husqvarna model in that it comes at a midrange price with accompanying features. The mower will handle up to a little more than 4,300 square feet after the owner installs a perimeter wire to define its boundaries. Mowing sessions are scheduled easily with an auto calendar function, and the mower is capable of memorizing and adjusting to your lawn's shape and size. Like the best robot mowers, it inclines up to 27%, comes with a free app and has anti-theft and weather features. Available on Amazon for around $2,000 to $2,200. The manufacturer provides a 1-year warranty. The company has an excellent reputation in standing behind its products. Smart mow feature provides seamless maneuverability and motion for an uninterrupted, meticulous mow. Promotes a longer mower lifespan and up to 10% faster area coverage! Fully programmable, this mower has weatherproof features, a rechargeable battery, all the basic features and more. It can take on a slope of up to 25%, will mow up to a quarter of an acre, and has a home base it returns to automatically for recharging. This is a silent model that can run for 24 hours with no issues. The blades are set to cut the grass finely, creating a mulch that feeds the lawn and doesn't need cleanup. Available on Amazon for around $1,300. The company offers technical support and a 1-year warranty on parts and labor, unless damage is due to improper use. Intelligent: Intelligent detection of the lawn, control of the cutting length, can be controlled by the embedded intelligent software to control the basic operation of the wheel, intelligent operation, according to different mowing methods to adjust. Safety: After entering the mowing area, the mower starts to adjust the blade for cutting, When someone or animal approaches the blade and stops automatically, you can set the mower anti-theft password. To prevent loss. Auto: When you travel far to preset the mower's working time and rest time, it will automatically start work, When the battery is low, it automatically returns to the charging mode. This charging mode is non-contact electromagnetic induction charging. This mower offers a solid value in return for a mid-range price. The Gardena uses a self-installed wire perimeter, continues mowing during the rain and operates with low-noise and free of emissions. This item weighs in at about 16 pounds, so it's easy to reposition. This model, like others, includes a charging station. The superior feature of the Gardena is its ability to mow a lot of territory -- more than 8,600 square feet. Available on Amazon for around $1,600. Manufacturer's warranty is available by contacting Amazon customer service or visiting the manufacturer's website. Robot mowers take the labor out of lawn care and have finally become somewhat affordable. They range from types that use simple programming on the mower to more complex programming using an app or Bluetooth technology. The question consumers should ask is whether the mower can successfully avoid obstacles, if it has theft protection and if it includes programming compatible with the user's comfort level. The easiest, most affordable mower on this list is the Robomow RX12 because parts are swapped out easily and installation requires minimal effort. For homeowners with smaller yards, we recommend this model. It does the job and is unlikely to malfunction or require costly repair. If you have a larger yard -- from a quarter to half acre -- then our top choices on this list are the KOHSTAR S520 4TH GENERATION or Robomow 630. Somewhat pricier, these two reliable robot mowers come with necessary anti-theft technology and are the best at avoiding obstacles. With your investment, you'll get high-quality robot mowers and hassle-free mowing, allowing you to reclaim your weekends for something a lot more enjoyable!